Great news for customers who call to order their oil who are concerned about the amount of oil they have left in their tank! There is a new product that we plan to sell and install that will allow you to monitor your oil tank and send reminders wirelessly to your phone or other device. This product is called the Smart Oil Gauge and is made by Connected Consumer Fuel, LLC. The Smart Oil Gauge uses an ultrasonic sensor to measure the level of oil in your tank throughout the day and transmits this information over your home’s Wi-Fi network. You can check the level of oil in your tank from any smartphone, tablet or PC from anywhere in the world. Wi-Fi network in your home that can pick up signals from the Smart Oil Gauge in your cellar. You must also have a smartphone, tablet or PC. Steel oil tank. This product does not yet work with Roth oil tanks, although they are working on a solution for owners of Roth double-wall tanks. A spare two-inch opening on top of your oil tank in which to install the Smart Oil Gauge. It is possible to install this device in place of your current oil gauge if it is in a two-inch opening and is not part of a combination vent alarm/gauge. Crowley Fuel is currently taking orders for these units to be delivered and/or installed in the summer of 2017. The cost for each Smart Oil Gauge is $169 plus tax. These gauges can be installed by the homeowner with a pipe wrench and joint compound, or customers can call us for an estimate to have our technicians do the installation. For most accessible oil tanks, the fee would be $80. Please call or email our office to see if a Smart Oil Gauge is right for you! Crowley Fuel is pleased to announce that we are now selling the best wood pellet on the market! 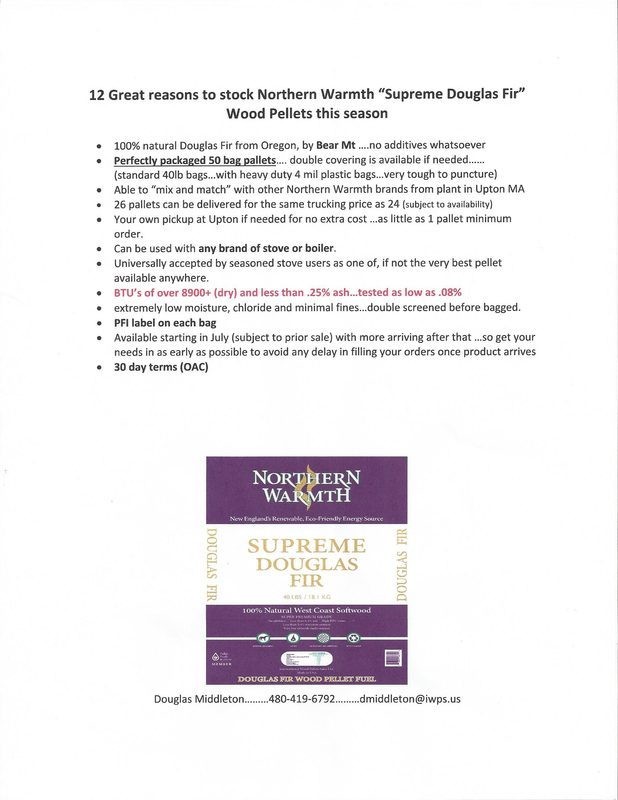 We have started taking orders for Northern Warmth Supreme Douglas Fir Wood Pellets. These pellets are made from Douglas fir trees by the Bear Mountain Mill in Oregon. A very popular and now defunct wood pellet supplier once sold pellets made by this mill. They marketed them as Super Premium and charged a premium price for them. Most pellet burners who tried them found this claim was not inflated, and there was great value in those pellets. The Northern Warmth Supreme Douglas Fir pellets are the best money can buy! For customers who want to get more heat per pellet and clean the ash from their pellet-burning appliances less often, these pellets are worth the price of $355 per ton. These pellets will actually be a better buy than the original pellets that came from this mill in Oregon, because they will come un-bagged in railcars to a facility in Upton. Once there, they are taken out of the railcars, fines (or sawdust) are removed, and they are bagged for the short trip to our yard. Customers can expect fewer fines and fewer problems with their augers. We expect to receive our first shipment of these pellets sometime this summer and are taking orders now. We should have plenty of bags available this fall for those who would like to try them out before making a commitment to buy them in tons. They are made from Douglas fir, which is the best material available for making wood pellets. They are produced at the Bear Mountain Forest Products Mill in Brownsville, Oregon. This is the same mill that produced the legendary Okanagan Douglas Fir wood pellets in the past. They are being bagged at the Upton/Grafton railyard facility by the Northern Warmth Company who removes the majority of the fines before they are bagged. They make a short trip from Upton/Grafton to Crowley Fuel in North Brookfield, which reduces the amount of fines created in transit. They burn hotter, which means you can set your stove on a lower setting and burn fewer pellets to get the amount of heat you need. Burning fewer pellets saves money. They burn cleaner, which means you will get more efficiency out of your stove and spend less time cleaning it. Please review the Analytical Test Report prepared by Twin Ports Testing, Inc. for the data on these most-excellent wood pellets. Northern Warmth Douglas Fir Supreme Wood Pellets cost more than most pellets because they are a premium product, and they are transported from across the country by rail. Don’t take my word for it. Come in, and buy a few bags to try out. You will see why they are so popular with a growing number of our wood pellet customers. Blizzards and Oil levels below half full! Well, it’s happened again this year! Winter waited until nearly spring to send us our only blizzard of the season. And our phones have been ringing off the hook with customers who want to get their oil tanks filled before the storm hits. We were ready for them this year. We saw this one coming for nearly a week and took care of our automatic-delivery customers so we could give our will-call customers the service that they wanted (whether they needed it or not). As a reminder, my December 2, 2016 blog “Bank and Tank” explains why customers should wait until they are at a quarter-tank on their gauge before ordering another delivery. They still have nearly 75-gallons in their tank to use before they run out. That’s a one- to two-week supply for most homes. The customers that we need to hear from when a snow storm is approaching are customers whose driveways go up or downhill. It can be very dangerous for an oil truck to go into a driveway that isn’t on the level. A standard oil truck does not have four-wheel drive and, believe it or not, are not the best vehicles in the snow. 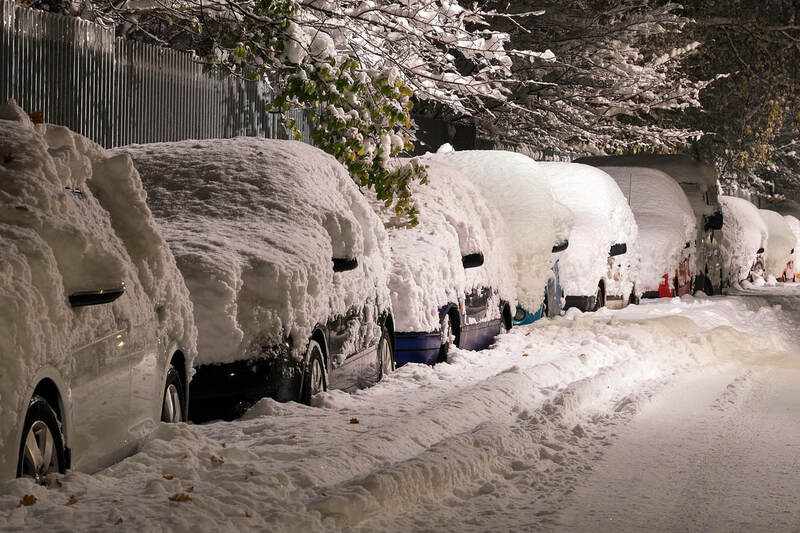 We appreciate will-call customers who call us several days before a storm or after the storm when their driveway is clear. The best way to deal with this oil-ordering and driveway-clearing problem is to call us to set yourself up as an automatic-delivery customer, and leave the responsibility to us. It doesn’t cost any more for automatic delivery and makes your life a little bit easier. Click, or call us today. A full-service oil company is one that provides not only the best quality heating oil, but also the best quality 24-hour service to their customers. For those of us who have been in this business for many years, this is the way it’s always been. And this is a promise that we hope to keep to anyone who calls our company for help in their time of need. It is an important commitment, which, in some cases, pre-empts all other commitments in our lives. So it has been with dismay that I have seen the rise of discount oil companies in recent years. They sell heating oil to people for a lower price, a price that a full-service company like mine cannot match. Many of these discount companies do not offer service, and if they do offer service, they are often unable to get to your home when you need them. There is a cost to buying the cheapest heating oil, and it becomes painfully apparent when you need service for your heating system. Recently we have received several calls from people who are having problems with their heating systems but buy their oil from discount companies. We would very much like to help them, but being so busy serving our own customers, we have been unable to do so. Our customers are our first priority. Fall is the busiest time of year for all of us in the heating business, because it’s the time most people remember they have a heating system that probably needs service. 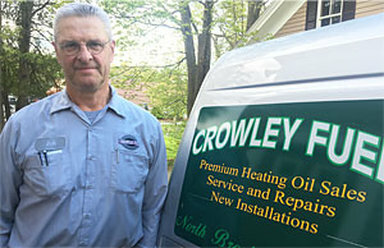 I have blogged recently about why, if you buy your oil from Crowley Fuel, spring and summer are better times for heating system maintenance. Anytime is a good time to change to a full-service company and start getting quality heating oil delivered to your storage tank, but spring and summer are particularly good to get your heating system properly serviced and prepared for another heating season. To those of you who are worried about getting your oil-fired heating system "cleaned" before winter, RELAX, you should be fine! 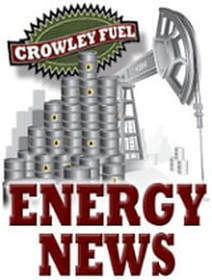 The oil Crowley Fuel has been selling for the past six years burns cleaner than ever, because it is blended with biofuel, which is the cleanest burning fuel available. Our heating oil is also low sulfur, which has less than 500 parts-per-million of sulfur. In addition, we have been treating our oil with stabilizing additives like Heating Oil Plus for 26 years. The benefit of these fuel quality improvements for our customers is that the flue passages in your heating systems will have less soot and scaling than systems typically had in the 20th century. The benefits on the fuel delivery side are less sludge buildup in tanks, filters, strainers, oil lines and nozzles. This means that our customers don't need to panic if they miss the anniversary for the servicing of their heating system. We have been calling the servicing of heating systems “tune-ups” for a number of years now, because this service involves less time cleaning the flue passages and more time spent adjusting the burner for maximum efficiency. Traditionally, fall is the time that people think about having their heating systems serviced, so fall is a very busy time for heating companies. Unfortunately, we often get too busy to do the annual servicing on the times and days most convenient for our customers. Spring is a very good time to get this important work done, especially if you have a system that does not make hot water and will be shut down for the summer. It can be very difficult to clean the flue passages of a boiler or furnace that has been shut down for a few months, especially if it is located in a damp place. The products of combustion can get wet, block flue passages and harden into a cement-like substance that can be hard to remove. So, you can probably wait to have your heating system serviced, but don't wait too long! The picture below shows a boiler whose owner waited 10 years between servicing, which was too long. The flue passages are nearly blocked, which resulted in flue gasses escaping into the living space. It has also caused the boiler to burn much more oil than necessary. So, stay calm, and stay warm! Try Out New Brands of Wood Pellets! There’s No Shortage of Wood Pellets at the Current Time! The warm winter and low heating oil prices from last heating season have left a lasting effect on this year's wood pellet supply. We have had no problems getting our customers as many as they want at prices that are comparable to last season. This means that, if you are unhappy with the brand of pellets you are currently using, you have the ability to come in and buy a few bags of some other brands made from different types of wood. 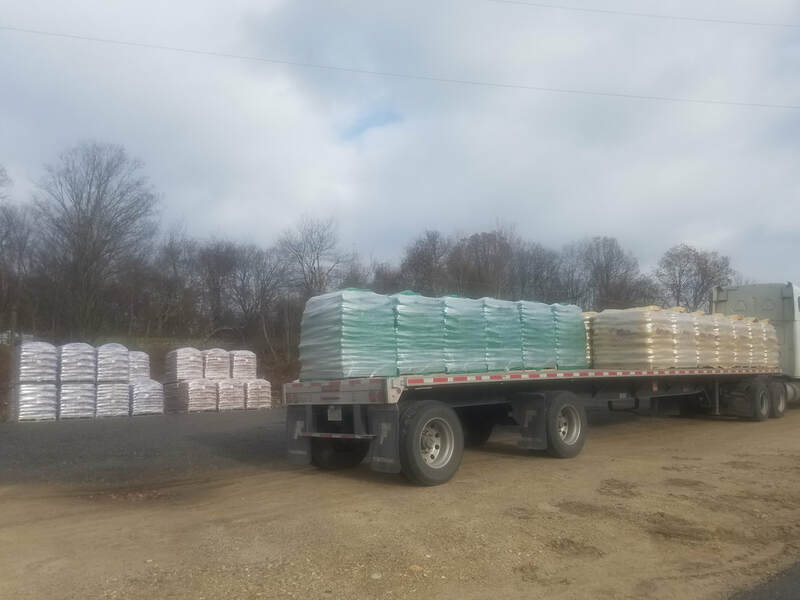 Local pellets, such as New England Wood Pellets, are mostly made of hardwood, and they are usually less expensive, because it costs less to deliver them here. Travelling shorter distances means there will be fewer fines in the bags, because they don't get jostled as much. They provide from 8,000 to 8,300 BTUs per pound with ash produced at .4- to .6-percent. Pine - These pellets typically come from the southern forests and are yellow in color. Their BTU production is greater than the 8,300 BTUs of hardwoods, and ash produced is less than .4-percent. They cost a little more, because they travel a bit further. A new brand on the market that has taken over for Okanagan Wood Pellets is Northern Warmth. Northern Warmth has a brand of pine pellets called Purely Pine that many of our customers will be giving a trial run, once the nights start getting colder. Spruce - These pellets come from the north and west where spruce trees are found. They travel about the same distance as pine pellets and are comparably priced. They produce 8,500 BTUs and less than .4-percet ash. We are selling Northern Warmth Super Spruce pellets this year, which were previously known as Okanagan Platinum. 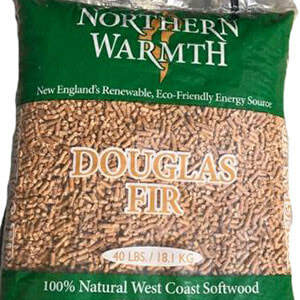 Doulas Fir - These pellets are the gold standard for wood pellets! They travel the greatest distance, so they typically cost the most. They produce greater than 8,700 BTUs and less than .5-percent ash. We are selling Northern Warmth Douglas Fir and Purcell Douglas Fir pellets, which are replacing the Okanagan Douglas Fir pellets. I recommend that you consider coming in to pick up a bag or two of one of these brands of pellets, and do a little experimenting before placing your order. You still have time! ​I recently had the opportunity to submit picks in a March Madness competition that our insurance company provided online and for free. First prize was an all-expense-paid trip to Las Vegas for two. To make a long story short, I was in first place going into the final game between Villanova and North Carolina. I had North Carolina to win, and if you were paying attention to the NCAA Men’s Basketball Championships, you know that my hopes for finally seeing the bright lights of sin city were dashed in the final second. Please don’t ask me how I did it, because, although I love sports, I don’t have the time to watch much college basketball. It did make things exciting for me for the few weeks that the tournament lasted, and it gave me some serious credibility whenever the topic of brackets came up with friends and family. I am hoping that my insurance company will do this again next year, and, with nearly 1,000 of their customers participating, I suspect that they will. I would like to tell you more about our excellent insurance company, Energi, and why you should even care that Crowley Fuel uses them for all of their coverage. The most important reason is their risk management program and the training they provide to me and my staff to help minimize the risk of oil releases and service problems. Their Regional Safety Manager Evan Huhtala has been to our office three times in the past year to conduct training for our drivers and service technicians. Topics have included: Heating Oil Delivery and Safety, Oil Tank and Oil Line Inspections, Distracted Driving, Vehicle Inspection, Vent Alarms and Winter Driving Safety. We have also conducted our own in-house training sessions both in group and online with materials provided by Energi. Our company has always put safety first, and I cannot think of a time in our 96-year history that we had to file a claim due to our own negligence. I hope that you, our Crowley Fuel customers, will take comfort in knowing that we have an insurance company like Energi, who not only have us covered for the problems that could arise, but give us the support to prevent those problems from happening in the first place. It helps when they give you the opportunity to have some fun and the chance to win some valuable prizes. I wish you luck in next year’s Men’s NCAA Basketball Championships. It is a wonderful thing to not have to open snail mail, and it is admirable to go green and eliminate paper from your life. But if you haven’t read your mail lately, you might have missed our news. As of September 22nd ​Crowley Fuel has merged with Tasse Fuel! Tasse Fuel is a family owned business in Southbridge that has been in existence for 71 years, holding the same values that Crowley Fuel has.